Like everyone else still riding the funtastic thrill wave of The Avengers, I've been on a bit of Hulk high for the past few weeks, and what better way to celebrate the historically underappreciated green lug than with a viewing of his very own 2009 double-feature, the dangling yet honestly titled Hulk Vs [sic]. Hulk versus what? I'm glad you asked, because you're in for a treat, bub. The first of the two features produced by Marvel Animation and visualized by the outsource animation wizards at Madhouse – wizards indeed, for how else could they continue to weave such immaculate spells as Death Note and Last Order whilst magicking out dozens of lesser licenses per day with the same careful craft? – is Hulk Vs WOLVERINE!!! (caps and exclamations added by yours truly for ecstatic emphasis). Reasons to be excited for such a match are manifold, but primary among them are, first, that who wouldn't want to see what happens when an unstoppable force meets an unbreakable adamantium object (with a rapid healing factor to boot), and second, that most previous animated versions of Wolverine, being television features, have been forced to severely censor his trademark ferocity to such ludicrous lengths as the now infamous Android Rage Principle, which states that Wolverine must never use his claws directly against foes made of organic material except indirectly to chop a tree or telephone pole down on top of them, the most egregious offender of his trope being the iconic 90s X-Men series. Thanks to Wolverine's incredible popularity, this tends to lead most animated series to an unhealthy overuse of robotic foes, particularly the old-school purple sentinels which, despite their colossal size and hyper-advanced weaponry (as well as the expectedly prohibitive cost of production thereof), became the de facto mooks of said 90s series and its successors. 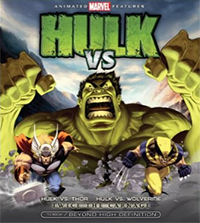 Hulk Vs Wolverine, as a direct-to-DVD feature, need follow no such expectations. There will be blood. Getting down to the feature itself, I'm disappointed to say that it's markedly the less successful of the two, despite its superior animation and character design. For the first few scenes of Wolverine hunting an unknown beast in his native Canadian territory, the short is as engaging in its pacing and character development as it is in its gorgeous scene work and mounting visual tension as the predator nears his prey. It's important to note that the expected role reversal never really occurs in as full effect as it should for something billed as a Hulk feature; it is very clear from the outset that writers Craig Kyle and Christopher Yost (both veterans of the field and frequent Marvel collaborators) are far more interested in Logan as a character than Bruce Banner, as the latter's brief appearance on screen as a sobbing, sniveling coward (the last of disparagements that should ever be applied to Banner) heightening the tension of an audience well aware of the Hulk's capabilities but undercutting sympathies of Banner as a protagonist in his own right. But as obviously invested as the writers are in Wolverine, the animators are more so. Of all the animated depictions of the world's favorite X-man to date, none have better captured the savagery of his form in motion. Pitting him up against a foe as hulking as the Hulk is an excellent way to accentuate the crouched, reflexive restraint that actually characterizes his fighting style, not the blind berserking rushes into which he habitually throws himself in so many other depictions. This Wolverine is worthy of his namesake, snarling and snapping as he dodges blows from a much more powerful but more lumbering foe, darting about with mustelidaean litheness from point to point while quick jabs of his claws bleed his enemy to exhaustion – or so would be the case if his opponent were anyone but the Hulk. Their combat is enhanced with only the slightest anime flourishes that serve more to accentuate the impossible angles and Grecian superimpositions more characteristic of western comics than of manga, and the result is a stunning clash of titans riveting enough that it feels criminally brief when it is finally interrupted. And what a rude interruption that is. 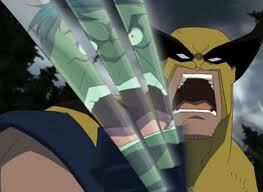 For if Hulk is given thematic short thrift in Wolverine's shadow during the first act, both are subordinated to foils in the second and third, the spotlight of which is seized entirely by the arrival of the Weapon X gang, who proceed to dominate the action of the remaining film so wholly as to make the film their own. While an intolerable abuse of the property from the perspective of a fan expecting the promise inherent in a picture entitled Hulk Vs Wolverine, from a film perspective it's a probably more structurally interesting than watching two unkillable rage monsters tearing apart the Rockies for a solid thirty-seven minutes (though I would be the first to volunteer for such a screening). At some points it practically becomes the Deadpool Vs Everyone Who Wants Him to Shut the Hell Up movie, which is, granted, not half as painful as it sounds given some better than adequate writing and a defining performance by video game veteran Nolan North (think Nathan Drake of Uncharted and his casting will seem all the more obviously inspired). Unfortunately, the meaning of the shift in focus is ultimately just that we're forced to watch Hulk smash and Wolverine slash everything in a confined laboratory environment with endless steel corridors as opposed to a vibrantly inked northern wilderness, but it's entertaining for what it is nonetheless. Despite my general lack of use for Thor as a character or a licensed property, I have no problem asserting that Hulk Vs Thor is the narratively stronger of the two pictures, though certainly the uglier. For one thing, it is far purer in its intent and delivery: Loki, as always, plans to kill his bigger, better-looking brother and take over Asgard for himself, this time by means of unleashing a mind-controlled Hulk on the gates of the celestial city. Hulk smashes, Thor bashes, and – thank goodness, for the first feature had me worried – Bruce Banner gets some serious screen time and appropriate exploration as the strong character he is. Sadly, the animation is a far weaker effort than that on display in HvW, despite the creative staff's clear preference for this story. There is a distractingly "floaty" quality to all character motions that drastically reduces the impact (figuratively speaking) of the kind of force we should be seeing in blows delivered by two of the most physically powerful beings in the classic Marvel canon. 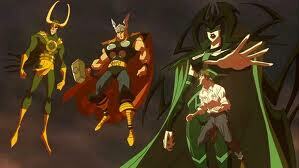 Wire-fu comes to mind, which makes sense given the past projects of the particular animators involved, and while that might be appropriate for a Shonen ninja it's certainly jarring when applied to creatures as grounded in their real-world physicality as Hulk and Thor. The scene work, too, is lacking, and a generic Asgard manages to look pitifully contrived and flat by comparison to the rich watercolors of mountain grandeur on display in HvW. Even more disappointing is Hell, which turns out to be a collection of poorly defined crags against some monotoned lava and a blank black sky, though Hela's draconic character design is easily the most inspired of the figures on screen in the film. That said, the plotting is more than sufficient to make up for the artistic weaknesses, with Banner being forced by separation from the Hulk to make a choice so desperate that I would be cruel to mention it here and thereby detract from the moment for new viewers. Suffice it to say that there is a three-minute dreamscape sequence which managed to bring me to tears. Yes, to tears, in a Marvel animated feature. Ponder that for a moment and consider whether you as a fan have a moral obligation to see this film if only for that sequence. The more talented members of the cast bring a lot more life to the animation in these scenes than they would otherwise deserve, with Graham McTavish in particular voicing an appropriately slimy Loki and Bryce Johnson bringing a lot more pathos to Banner than I've ever seen him display in his live action roles. Obviously this double feature was never intended to comprise some great work of Art, or even anything more profound than a commercially motivated, relatively high-budgeted piece of indulgent fan fiction. But if you don't have enough love for the Hulk, Wolverine, and god-knows-maybe-even-Thor as characters to be drooling at the thought of watching them thrash one another in mostly quality animation for a solid 82 minutes, then I don't know why you bothered to read this far in the first place. The rest of you, go forth and indulge thyselves accordingly. Grade: B+ qua American superhero animation, C- qua some more meaningful standard of film quality.